The North Texas tennis team (11-10, 4-3 Conference USA) concluded its 2018-19 regular season on Thursday with a loss against Southern Methodist. Despite the loss, the Mean Green finished with their first regular season above .500 in three years. North Texas played in the ITA Regional Championships and a variety of invitational tournaments during the fall 2018 season. While wins in those matches did not affect the team’s regular season record, they placed a benchmark on the talent the team had. Seniors Maria Kononova and Tamuna Kutubidze won the ITA Doubles Regionals during the fall, inspiring the rest of the Mean Green heading into the spring. Kononova and Kutubidze continued to lead the team dfuring the spring season. The duo lost just one match in doubles this year. Kononova was also named the Conference USA Athlete of the Week on April 10 for her play in doubles and singles. The Mean Green were never more than four matches above .500 during the spring. Their longest win streak was in February when the team won three straight matches to start the month. One of those tough losses was to a ranked Old Dominion team on March 8. 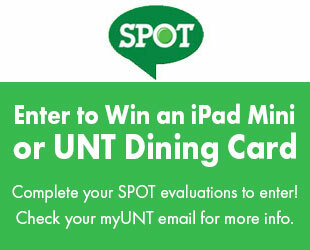 North Texas played the No. 24 team in the nation on that day and the two teams dueled right to the end. Old Dominion wasn’t the only tough loss during the season. Every missed opportunity was tough on the team but Lama feels that they have been made stronger by the tests they’ve been given. The Texas-San Antonio match was another 4-3 loss. The Mean Green rebounded by winning their next two matches following the loss. Resilience has created multiple positive moments for the team throughout the season to contrast the tough losses. The team has stepped up to beat accomplished programs and also win in difficult situations, according to Lama. Lama and his players credit the team’s comradery for helping them have one of their best seasons in years. The team sticking together both on and off the court has created a significant chemistry boost in matches, according to Kutubidze. That trust will be a key factor in the Mean Green’s season continuing far past Thursday’s match against Southern Methodist. The team knows they have to stick together in order to have a chance at a conference title. Thursday’s match was also the team’s Senior Day. Kononva, Kutubidze and fellow senior Minying Liang were recognized for the accomplishments they’ve achieved in their four years with the program before and after playing their final matches at Waranch Tennis Complex. UP NEXT: The Mean Green will travel to Houston on April 18 for the C-USA Championships. 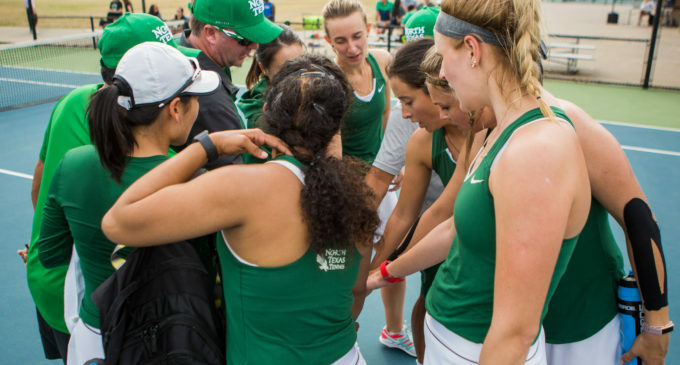 Featured Image: After defeat in doubles play, the Mean Greens huddles up before seeking redemption in singles at the Waranch Tennis Complex on Feb. 15, 2019. Image by: Kara Dry.